If you have trees listed on the Forest Service Fire Inspection report you received or if you have trees that are otherwise a hazard to your cabin please follow the instructions here. Removal of a “hazard” tree” involves a process that should be followed. The Forest Service is currently formulating a comprehensive process to account for these hazard trees on cabin lots. COMPLIANCE WITH LAWS, REGULATIONS, AND OTHER LEGAL REQUIREMENTS. In exercising the privileges granted by this permit, the holder shall comply with all present and future federal laws and regulations and all present and future state, county, and municipal laws, regulations, and other legal requirements that apply to the permit area, to the extent they do not conflict with federal law, regulations, or policy. The Forest Service assumes no responsibility for enforcing laws, regulations, and other legal requirements that fall under the jurisdiction of other governmental entities. Please follow the guidelines listed below. 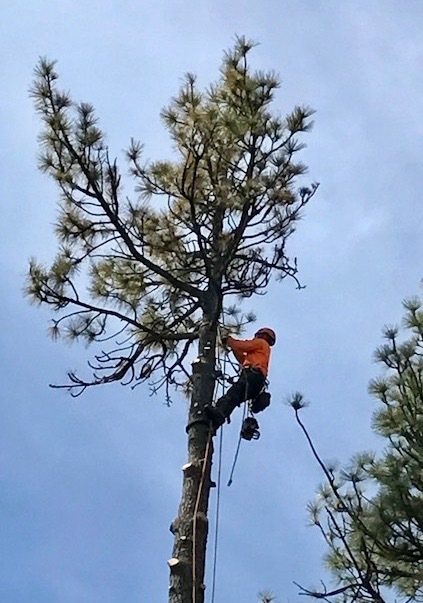 3) Send an e-mail or letter titled “hazard tree removal,” a copy of the report and pictures of the trees in question to Robert Heiar, at rheiar@fs.fed.us or you can call at 858-445-6235 with a verbal request.